This week there were no significant military changes on the ground in Syria and Iraq. The most prominent ISIS activity of the past week was a large-scale attack by suicide bombers, carried out with truck/car bombs or explosive belts in Iraq and Syria. ISIS carried out lethal terrorist attacks against an Alawite neighborhood in Homs, rival rebel organizations north of Aleppo, Kurdish forces in the area of Al-Hasakah, the Iraqi Army in the area of Ramadi, an Iraqi governmental institution in the vicinity of Samarra, Shiite and governmental targets in Baghdad, and the Kurdish Peshmerga forces near the Iraqi-Syrian border. This terrorist offensive, which is unusual in scope and carried by dozens of suicide bombers may, in the ITIC’s assessment, indicate that ISIS is in distress in the various battle zones, especially in Iraq. This has already been expressed in statements made by US President Barack Obama, that ISIS has lost 40% of the territory that it had held in Iraq, and has not had a single ground victory since the summer.In the ITIC’s assessment, the US President’s statements refer to the liberation of the areas of Tikrit and Baiji (north of Baghdad) and the area of Sinjar (in northwest Iraq) by the Iraqi Army, Shiite militias that support it, and the Kurdish forces, with operational and air support from the US and the US-led coalition. Syria– the airstrikes were concentrated in the areas of Deir al-Zor, Marea (north of Aleppo) and Al-Raqqah. The targets included ISIS artillery, vehicles and oil wells, among other things. Iraq– the airstrikes were concentrated in the areas of Kisik, Mosul, Ramadi, Tal Afar, Sinjar, Fallujah, Habbaniyah and Tikrit. The targets included operatives, battle positions, bunkers, roads used by ISIS operatives, weapons, vehicles, and a car bomb workshop, among other things. During a briefing at the Pentagon, US coalition spokesman Colonel Steve Warren said that three senior ISIS leaders have been killed in coalition airstrikes. According to the report, the dead are ISIS chief financial officer Muwaffaq Mustafa Mohammed al- Karmoush, aka Abu Saleh; senior ISIS leader Abu Maryam; and Abu Rahman the Tunisian, a senior ISIS officer who handled the transfer of information, operatives and weapons. According to Colonel Warren, the three were killed in three separate attacks in late November 2015, in the area of Tal Afar, northern Iraq (Christian Today, December 14, 2015). In a forceful speech delivered at the Pentagon on December 14, 2015, US President Barack Obama declared, among other things, “So far Isil has lost about 40% of the populated areas it once controlled in Iraq, and it will lose more […] Isil’s lost thousands of square miles of territory it once controlled in Syria and it will lose more.” Obama added, “The special forces that I ordered to Syria have begun supporting local forces [an implicit reference to the Kurdish forces] as they push south, cut off supply lines and tighten the squeeze on Raqqa” (theguardian.com, December 14, 2015). The US President’s remarks reflect the achievements of the US and its local allies in the campaign against ISIS, especially in Iraq. Since the summer, ISIS has lost the areas of Tikrit and Baiji (north of Baghdad) and the area of Sinjar (in northwest Iraq) to the Iraqi Army, the Shiite militias, and the Kurdish forces. In Ramadi, the most prominent city of the Al-Anbar province which was taken over by ISIS, it is facing increasing pressure on the part of the Iraqi Army and Shiite militias, with US and coalition air support. The Kurdish forces in Syria also achieved successes in the areas under their control along the Turkish border. However, ISIS is still well established in western Iraq and in Syria, and in the major cities of Mosul and Al-Raqqah, and the situation on the ground remains far from conclusive. During a hearing before the Senate Armed Forces Committee, US Secretary of Defense Ashton Carter said that the US Army and local forces were “gaining momentum” in the fight against ISIS. He said that the United States would increase its efforts to defeat ISIS. Carter noted that the US had deployed Special Forces in Iraq and Syria and, if necessary, it would expand its efforts. The US is also prepared to expand its efforts to harm ISIS’s oil infrastructure, which have proved to be effective. Carter added that he had recently called on European countries to increase their airstrikes against ISIS. He noted the lack of Arab/Sunni countries, especially the Gulf States, fighting against ISIS and said that the US proposed the establishment of a combined Arab force to support the fighting (Newsweek, December 12, 2015). During a visit to the US, British Defence Secretary Michael Fallon expressed his frustration at what he felt was the slow pace of the war against ISIS. According to Fallon, immediately after the decision by Parliament, Britain doubled the number of aircraft stationed at the airbase in Cyprus. These aircraft immediately went into action and began a series of successful airstrikes against ISIS infrastructure targets, mainly in eastern Syria where the oil fields are located. Fallon declined to specify a timeframe for the duration of the fighting (The Guardian, December 11, 2015). US Secretary of State Ashton Carter sent a letter to Germany asking it to increase the scope of its military aid to the fight against ISIS. German Chancellor Angela Merkel rejected the US request, saying that Germany is doing its share in the war against ISIS and that she does not see any need to discuss the issue further (Reuters, December 14, 2015). Russian warplanes continued their attacks in Syria, mainly in the areas of Latakia, Al-Hasakah, Deir al-Zor, Hama, Idlib, Aleppo and Damascus. 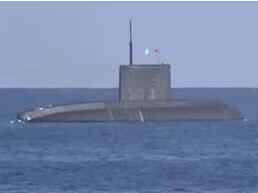 At the same time, Russia stationed a submarine armed with cruise missiles in the eastern basin of the Mediterranean Sea, off the coast of Syria. Cruise missiles were launched from the submarine at ISIS targets in Al-Raqqah, a distance of 1,500 km from the coast. Russian Minister of Defense Sergey Shoygu has informed President Putin of the results of the Russian attacks in Syria. According to Shoygu, ISIS’s oil infrastructure and an ammunition storehouse were damaged. He said that Israel and the United States had been informed before the attack. The Minister of Defense added that in the past few days, strategic bombers, which took off from Russia, had [again] been deployed (RT, December 8, 2015). He said that since joining the fighting in Syria, Russian warplanes had destroyed more than 8,000 military facilities in more than 4,000 sorties (TASS News Agency, December 11, 2015). At the annual forum meeting of the Russian Defense Ministry (December 11, 2015), Russian President Vladimir Putin discussed the fighting in Syria. According to Putin, he ordered the Russian forces to act aggressively to destroy every target that represented a threat to them or to the Russian infrastructure located in the area. According to Putin, terrorism in Syria is a direct threat to Russia and is what is driving Russia’s activity in Syria. He said Russia was also helping the forces of the Free Syrian Army (rebel organizations supported by the West) fighting against ISIS by providing air support, supplying arms and ammunition and carrying out joint operations with Assad’s military forces. He noted that he had ordered Russian forces to coordinate their attacks with Israel and the US-led coalition (Express, December 12, 2015). In response, US Department of State Spokesman John Kirby said that he could not verify Putin’s statement that Russia was supporting the Free Syrian Army and supplying it with weapons and air support (Reuters, December 12, 2015). Various speakers on behalf of the Free Syrian Army also refuted Putin’s statements: Ahmed Berri, Chief of Staff of the Free Syrian Army, refuted Putin’s statements, claiming that Russia was attacking outposts of the Free Syrian Army almost daily (National Syrian Coalition, December 12, 2015). According to the Free Syrian Army Head of Intelligence, they are ready to provide Russia with data, maps and documents indicating ISIS’s positions in Syria (Sputnik, December 14, 2015). According to Abd al-Razzaq Ahmed Farija, head of the Military Council of the Syrian Army in the area of Hama, Russia tried to contact Free Syrian Army officers to persuade them to change their priorities in the fighting but failed to do so (All4Syria, December 15, 2015). In the ITIC’s assessment, Putin’s statements that Russia is helping the Free Syrian Army were intended to strengthen the international legitimacy of the airstrikes carried out by Russia in Syria.The Free Syrian Army, which is supported by the West, are rebel organizations that constitute a major target for most of the Russian airstrikes designed to support the Assad regime. At a meeting with his Italian counterpart, Russian Foreign Minister Sergei Lavrov said that in recent months, the international coalition had increased its airstrikes, especially against ISIS’s oil assets.Lavrov said he preferred the coalition’s campaign against ISIS to be based on resolutions of the UN Security Council and the international laws requiring the Syrian government’s approval. According to him, Russia wants to coordinate its efforts against ISIS with the international coalition, but not to join it (TASS News Agency, December 11, 2015). In the meantime, tension continues between Russia and Turkey, which began after the interception of the Russian aircraft. During the week, there were two incidents: The first incident occurred when a photo of a Russian soldier carrying a rocket launcher on his shoulder during a voyage by a Russian ship in the Bosporus Strait was distributed (the Turkish Foreign Minister called this provocation); Another incident occurred on December 13, 2015, when a Russian warship sailing in the Aegean Sea fired warning shots at a Turkish fishing boat. Following the incident, Turkish Prime Minister Davutoğlu said that Turkey was examining possible measures against Russia and would impose sanctions on Russia if necessary. He added, however, that Turkey remained open to negotiations with Moscow (RT, December 13, 2015). This week as well, there were no significant changes on the ground. This week was marked by a large number of car bomb and suicide bombing attacks carried out by ISIS against the rebel forces north of Aleppo, against the Kurds in the area of Al-Hasakah, and in an Alawite neighborhood in Homs. These attacks killed dozens of people. In the Homs province, ISIS operatives managed to retake the village of Mheen and two nearby villages southeast of Homs. In southwest Aleppo, the Syrian Army managed to take over several villages, killing dozens of Jaysh al-Fatah operatives (an Islamic umbrella framework led by the Al-Nusra Front). Syrian Prime Minister Wael al-Halqi and the Syrian Foreign Ministry condemned the attack. According to them, such attacks will not intimidate the Syrian people but will only increase their determination to fight terrorism (SyrianNews Agency, December 12, 2015). In several neighborhoods in Homs, demonstrations were held against the governor of the province, in response to the detonation of the car bomb (Khatwa, December 12, 2015). The Russian Foreign Ministry sent letters to the UN Security Council and the office of the UN Secretary General condemning the series of attacks carried out in Syria. In the letters, the Russians urge the international community to respond in light of the terrorism. The letters also claim that these attacks could not have been carried out without assistance provided to the terrorist operatives outside Syria (RT, December 14, 2015). The UN Security Council rejected the proposal to condemn the act of terrorism drafted by Russia with the support of Syria (RT, December 14, 2015). During the week, ISIS reported a number of successes in the area southeast of Homs (where there were local clashes last week as well). According to ISIS, its operatives recaptured the village of Mheen and two nearby villages from the Syrian Army. In addition, large quantities of weapons reportedly fell into ISIS’s hands (dabiqnews.com, December 10-11, 2015). A car bomb and a suicide bomber blew up near Al-Ahali Hospital in the city’s Tel Al-Zahra neighborhood. Most of the residents in this neighborhood are Alawites, a sect affiliated with the Syrian regime. According to media reports, some twenty people were killed and around 100 were wounded in the attacks (Al-Mayadeen, December 12, 2015). As a result of the car bomb explosion, gas tanks in the area also exploded, causing more deaths and injuries (Al-Nashra, December 12, 2015). ISIS claimed responsibility for the attack (Khatwa, December 12, 2015). On December 10, 2015, the Syrian Army reported finding a truck bomb, apparently abandoned by ISIS in the city of Palmyra (YouTube, December 10, 2015). According to a report on the Hezbollah-affiliated Lebanese website Al-Ahed News, ISIS operatives abandoned the truck bomb and fled. The truck bomb’s target was a Syrian position in an area ten km west of the city of Palmyra (alahednews.com, December 10, 2015). On December 11, 2015, ISIS claimed responsibility for the detonation of a booby-trapped APC in the staging zone of rebel organizations in the village of Jarez, about 40 km north of Aleppo (near the border with Turkey). 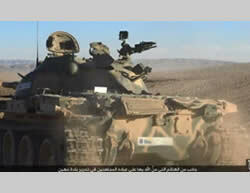 The booby-trapped APC was driven by a suicide bomber codenamed Haydarah al-Badrani. The explosion had killed and wounded dozens, including Abu al-Hassan, commander of the main force of Al-Jabha al-Shamiya, a framework of rebel organizations operating in northern Syria (dabiqnews.com, December 11, 2015). Local skirmishes continued in the rural area south of Aleppo. According to a report from December 12, 2015, Syrian Army troops managed to take over six villages in the area of Qurayhah, in the rural area south of Aleppo (Facebook, December 12, 2015). In the Al-Hasakah province as well, ISIS carried out a series of truck bomb attacks against the Kurdish forces:in the town of Tel Tamar, northwest of Al-Hasakah, three truck bombs were detonated (Al-Arabiya al-Hadath, December 12, 2015). The trucks exploded in front of a hospital, in the open market, and in a residential area controlled by the Kurdish forces. According to a spokesman for the Kurdish forces (YPG), between 50 and 60 Kurds were killed and around 80 were wounded (Al-Arabiya, December 11, 2015). ISIS claimed responsibility for the truck bomb attack (ISIS-affiliated Twitter account, December 12, 2015). An IED exploded in the center of the Kurdish forces in the city of Al-Qahtaniya, killing three Kurdish operatives. Another car bomb exploded in a village west of Al-Hasakah (local coordinating committees, December 12, 2015). 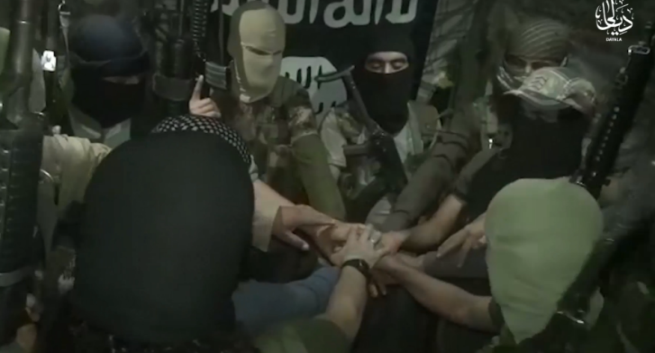 An agreement has apparently been reached between ISIS and the Al-Nusra Front, in which, in the ITIC’s assessment, the Syrian regime is also involved. The agreement pertains to the control over parts of the Yarmouk refugee camp and the nearby neighborhoods (south of Damascus). According to reports, an accord has been reached, through intermediaries, with regard to the neighborhoods of Al-Hajar al-Aswad (an ISIS stronghold), the Yarmouk refugee camp, and Al-Tadamon. Under the agreement, the gunmen who will be evacuated from these areas will be sent to Idlib (an Al-Nusra Front stronghold) and to Al-Raqqah (an ISIS stronghold), and about 140 wives and children of ISIS operatives will also be sent to Al-Raqqah.State authorities will resume control over the places that are evacuated. 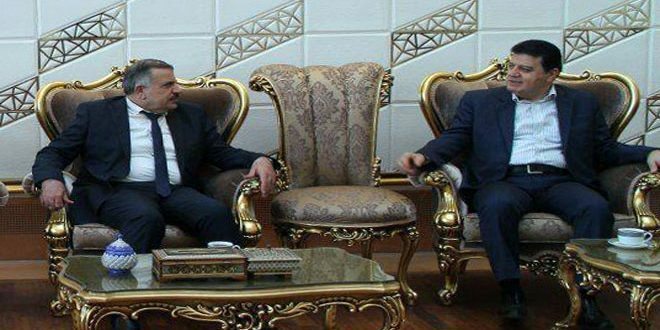 It was also decided that the withdrawal of the gunmen will be backed by sureties from the UN and a number of other countries (Al-Watan, December 9, 2015). However, we should wait and see whether and how the agreement is implemented in practice. This week there has been no material change in the situation on the ground.In the city of Ramadi and the surrounding area and in the cities of Baghdad and Samarra, ISIS carried out suicide bombing attacks and car bomb attacks and planted IEDs. This occurred concurrently with the wave of attacks carried out by ISIS in Syria. ISIS continues its terrorist and guerilla attacks against civilians and soldiers in Baghdad: On December 13, 2015, three Iraqi soldiers on patrol were injured in an IED explosion in southern Baghdad (Al-Sumaria, December 13, 2015). On December 12, 2015, there were 10 civilian casualties in the Al-Wahda neighborhood in southern Baghdad when an IED exploded near a football stadium (Al-Alam al-Youm, December 13, 2015). On December 9, 2015, nine people were killed and 14 others were injured in Baghdad when a car bomb driven by a suicide bomber exploded at the entrance to a Shiite mosque (BBC in Arabic, December 9, 2015). On December 12, 2015, 31 members of the Iraqi security forces were killed in an explosion of three car bombs in southeast Ramadi (Aamaq, December 12, 2015; Al-Jazeera TV, December 12, 2015). This was probably in the Al-Tamim neighborhood, part of which was taken over from ISIS by Iraqi Army troops last week. On December 13, 2015, a suicide bombing attack was carried out when a car bomb driven by a suicide bomber blew up in a staging zone of the Iraqi security forces southeast of the city of Ramadi. The blast killed 16 Iraqi troops and members of the Shiite militias that support the Iraqi Army (Al-Jazeera TV, December 13, 2015). According to an Iraqi Army report, it killed 11 ISIS operatives and destroyed three car bombs on roads leading to the south and north of the city of Ramadi (Al-Sumaria, December 13, 2015). In the area of the border between Iraq and Saudi Arabia (within the Al-Anbar province), six Iraqi Border Police soldiers were killed and fourteen others were wounded by a car bomb on December 12, 2015. ISIS claimed responsibility for the attack (Al-Jazeera TV, December 12, 2015). On December 12, 2015, ISIS claimed to have fired machine guns and rockets at a military base north of the city of Tikrit, hitting three Iraqi helicopters. An Iraqi “security source” confirmed that mortar shells were fired at the base and that a helicopter on the ground was indeed hit (Aamaq; Al-Jazeera TV, December 12, 2015). ISIS posted photos of the rocket fire at the military base (Akhbar al-Muslimeen, December 12, 2015). In the area of the city of Samarra, north of Baghdad, there are still clashes between ISIS and the Iraqi security forces. ISIS reported this week that on December 10, 2015, two operatives wearing explosive belts broke into an Iraqi government building (the Al-Ishaqi district) south of Samarra. They activated their explosive belts, killing 56 Iraqi Army soldiers (Aamaq, December 12, 2015). Conversely, the Iraqi Army reported that the Iraqi Air Force had destroyed an ISIS “operations room” west of the city of Samarra, killing seven ISIS operatives (Shafaq News, December 13, 2015). According to the Iraqi Interior Ministry, an Iraqi Army airstrike near the Iraqi- Syrian border killed at least 15 ISIS operatives and injured others.Those killed included Abu Amana al-Masri and Mohammad Hamid al-Alassafi, senior ISIS officials who were close to ISIS leader Abu Bakr al-Baghdadi. 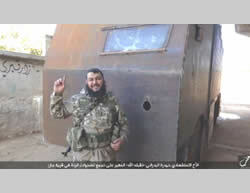 The injured reportedly included one of Abu Bakr al-Baghdadi’s aides, Abu Ali al-Anbari, who was sent to a hospital in Abu Kamal for treatment (Al-Arabiya TV, December 12, 2015). Two days earlier, ISIS issued a video documenting the fighting in northern Al-Jazeera. The video shows mortar shells and artillery being fired at the Kurdish Peshmerga forces’ headquarters, northeast of the city of Mosul (archive.org, December 10, 2015). According to a report by ISIS, the attack also included suicide bombers who broke into the headquarters and killed 16 members of the Peshmerga (Aamaq, December 13, 2015). Al-Jazeera TV reported that it had obtained original ISIS documents indicating how it operates the 27 oil fields under its control in Syria. According to the documents, about half of these oil fields are located in the Deir al-Zor province and the rest in the provinces of Al-Hasakah and Al-Raqqah. According to the documents, ISIS’s monthly revenues from the oil fields amount to around USD 60 million, around USD 34 million dollars of which comes from the 18 oil fields in the area of Deir al-Zor (Al-Jazeera TV, December 13, 2015). According to Adam Szubin, acting US Treasury undersecretary for terrorism and financial crimes, ISIS is collecting high profits from the production and the sale of oil and emphasis should be placed on damaging the infrastructure.Szubin also revealed that the Assad regime was among the main buyers of oil from ISIS and that some of it also reached Turkey and the Kurdish areas. According to Szubin, the volume of the oil trade is approximately USD 40 million dollars per month (Reuters, December 10, 2015). In the past, ISIS’s revenues from the oil fields in Iraq and Syria were estimated at USD 100 million per month (September 2014). The documents obtained by Al-Jazeera (assuming that they are authentic) indicate that ISIS’s monthly revenues have dropped by tens of millions of dollars. Now the airstrikes of the US and its allies and Russia are focused on ISIS’s oil infrastructure and marketing system, with the goal of further reducing its profits from the production of oil, thereby harming its military and governmental capabilities. During the week, the Egyptian security forces continued military operations against ISIS’s Sinai branch. In this context, they carried out intensive activity, mainly in the area of Rafah, Sheikh Zuweid, and Al-Arish.Many terrorist operatives were detained, infrastructure was destroyed, and cars and motorcycles without license plates were confiscated. In addition, the Egyptian security forces have stepped up supervision at checkpoints and set up many more mobile checkpoints (Al-Youm al-Sabea, December 14, 2015). Egyptian security sources reported that security apparatus uncovered a squad of women married to senior officials of ISIS’s Sinai province, who serve as collaborators to ISIS operatives. The Egyptian security forces detained a woman carrying a walkie-talkie and mobile phone chips intended for one of the operatives. ISIS operatives reportedly use women to transfer IEDs and plant them on roads used by military vehicles. They also help operatives monitor the activities of the Egyptian security forces (Al-Watan, December 13, 2015). On December 13, 2015, a policeman was killed by sniper fire at the Al-Kharoubah checkpoint in southern Sheikh Zuweid (Veto portal, December 13, 2015). On December 12, 2015, an officer and nine soldiers from the police force were injured in southern Al-Arish when an IED planted in an APC exploded (Al-Watan, December 12, 2015). ISIS’s Sinai province claimed responsibility for the blast (ISIS-affiliated Twitter account, December 12, 2015). On December 13, 2015, the ISIS website reported that on December 12, 2015, its operatives had detonated an IED against an Egyptian Army mine clearing vehicle on the road connecting Sheikh Zuweid and Rafah (dabiqnews.com, December 11, 2015). On December 14, 2015, an Egyptian soldier was shot dead while guarding the area of Al-Kharoubah, northeast of Al-Arish (Al-Youm al-Sabea, December 14, 2015). On December 14, 2015, an Egyptian soldier was wounded by an IED near an APC in the vicinity of the fish market in central Al-Arish (Al-Youm al-Sabea, December 14, 2015). The Egyptian commission of inquiry which investigated the circumstances of the Russian plane crash has prepared a preliminary report and sent it to the International Air Transport Association (IATA). The report states that no evidence of involvement of terrorist elements or other illegal activity was found in the Russian plane crash (Reuters, December 14, 2015). According Ayman al-Muqaddam, chairman of the commission of inquiry, they are now waiting for Russia’s reports on identifying the bodies and determining the status of the victims (Al-Youm al-Sabea, December 14, 2015). Russian Presidential Spokesman Dmitry Peskovsaid he could not comment on the announcement but he could repeat the investigation by their experts, who concluded that the crash occurred due to a terrorist attack (TASS News Agency, December 14, 2015). ISIS announced the death of one of its commanders, Issa Abd al-Karim al-Laqta, aka Abu Aisha al-Ghazawi. He was killed on December 7, 2015, in a Russian airstrike on the city of Al-Raqqah, Syria (Terror Monitor, December 9, 2015). According to Palestinian media reports, Issa Abd al-Karim al-Laqta, aka Abu Aisha al-Ghazawi, was from the Sheikh Radwan neighborhood in Gaza. According to the reports, he was a former operative in the military wing of Hamas and decided to leave due to differences of opinion. About a year ago he went to Syria, where he joined ISIS. In Syria, he married and fathered a child. 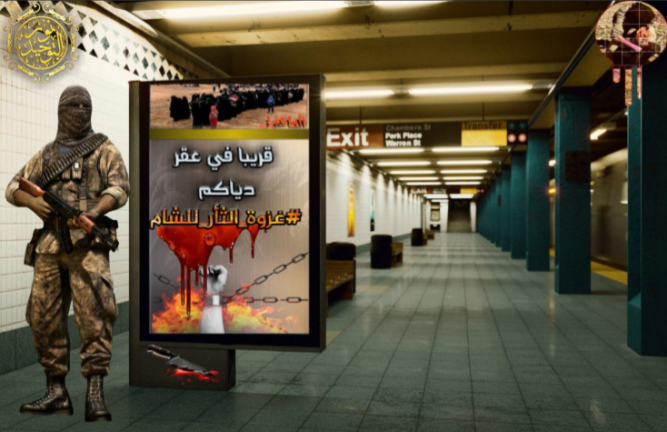 Six months ago, Al-Laqta threatened Hamas, saying that terrorist attacks would be carried out in the Gaza Strip and it would be turned into a “pool of blood” if Hamas didn’t release the Salafist operatives that it was holding (Al-Watan, December 9, 2015). There are various versions regarding the circumstances of his death. According to one version, he was killed in the rural area of Aleppo, and according to another version he was killed in a Russian airstrike in the area of Al-Raqqah (The Islamic News Agency; Terror Monitor, December 8 and 9, 2015). A Muslim Israeli citizen who had served as a combatant in the IDF’s Givati Brigade recently joined the ranks of ISIS. He is a young man from the Arab town of Fureidis, in the outskirts of Haifa. According to his papers, he was discharged from the IDF in January 2014. He left Israel for Turkey and from there he went to Syria. He took his dog tags with him. The young man’s mother claims that his family has not been in contact with him for the past five years, because of a family feud. After leaving home, he enlisted into the IDF and since then they do not know what has become of him (Haaretz Israeli daily, December 14, 2015). A series of articles recently appeared in the Egyptian press warning against the danger to Egypt’s national security in light of the strengthening of ISIS in Libya.According to the Egyptian media, ISIS aims to establish a western desert province in Egypt in order to connect ISIS’s branches in Libya and Sinai. One of the journalists called on the Egyptian authorities to take preventative measures such as attacks on ISIS operatives in Derna and Sirte rather than wait until ISIS operatives reach the Egyptian border (Al-Watan, December 11, 2015). Another journalist, Mohammed Jibril, wrote that Egyptian forces virtually eliminated the pockets of terrorism in the Sinai Peninsula but now ISIS’s activity on the Egyptian-Libyan border was posing a danger (Al-Masaa, December 13, 2015). Another journalist, Makram Muhammad Ahmad, demands that Egypt take the initiative and formulate a new strategy for dealing with the risk of ISIS in Libya (Al-Ahram, December 6, 2015). In Sirte, ISIS published the “city charter” (wathiqat al-madina), regulating the lives of the residents and their interaction with ISIS, which controls the city and its surroundings. According to the document, it is forbidden to trade in and consume alcohol, drugs and cigarettes; money that had been in the possession of the “infidel” government would be returned to the Muslims, and the caliph (ISIS leader Abu Bakr al-Baghdadi) will decide how to allocate it for the benefit of the Muslims; residents are warned not to maintain contact with the “infidel” governments; soldiers and police officers [of the Qaddafi regime] are referred to as “infidels” and are called to report in designated areas in order to “repent,” otherwise they will be executed; ISIS will continue destroying pagan elements; ISIS prohibits political parties and associations of any kind; women are required to wear the long traditional dress (jilbab) and to remain at home; ISIS stresses that it will continue to impose Sharia law on the city’s residents (Libyan journalist’s Twitter account, December 10, 2015; The Tunisian Al-Sabah News, December 11, 2015). In return for complying with the strict Islamic code of conduct, ISIS is supposed to provide the residents with security and services required for daily life, which had previously been provided by the Libyan government. In the ITIC’s assessment, the “city charter” symbolizes the establishment of ISIS in Sirte, its territorial base in Libya, and the intensification of its control over the city’s residents. The city charter is based on the model expressed in similar documents, which were issued by ISIS in Mosul, Iraq and in Al-Raqqah, Syria. According to local sources in the city, following the detention of three ISIS operatives, two Tunisians and one Libyan, ISIS put on a military parade in the city, in which ISIS operatives spent several hours riding around the city in more than thirty vehicles. 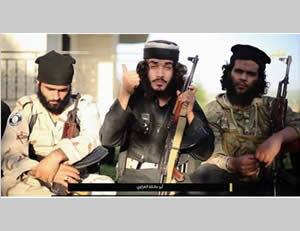 ISIS operatives also set up checkpoints in the Al-Khatatba area, the eastern outskirts of the city. Following the show of force, the Tunisian Army sent reinforcements to the Tunisian-Libyan border area (Al-Hadath, December 10, 2015; tunisie-telegraph, December 10, 2015; Facebook page of the Dinar Valley News Agency, December 10, 2015; Daily Mail, December 11, 2015). Sabratah is an important Libyan city located west of the capital Tripoli, near the border with Tunisia, and is cut off from the territorial base of ISIS in Sirte. Power struggles are taking place in Sabratahbetween ISIS and the local militias. ISIS does not (yet?) have effective control of the city but it has a presence and intense activity there. It seems that due to its proximity to Ras Jadir, the Libyan border crossing with Tunisia (which is a favorite target for terrorist attacks by ISIS from Libyan territory), the Tunisian authorities are closely monitoring developments in the city. Amin al-Baoudi, a Syrian-born US citizen accused of smuggling weapons to the Al-Nusra Front, has been prosecuted in the US. According to the prosecution, he planned to train fighters in Syria and smuggle in weapons worth USD 30,000 (AP, December 8, 2015). At a hearing before the US Senate, FBI Director James Comey said that ISIS was working to introduce terrorist operatives into the US or to persuade people, who are already in the US, to carry out attacks in the country. He also expressed concern that ISIS operatives could print passports that look like Syrian passports and pose as refugees from Syria in order to enter the United States (Tribune News Service, December 12, 2015). The US House of Representatives overwhelmingly passed a bill that would prevent anyone who visited Iraq, Iran, Syria or Sudan during the past five years from entering the US without a visa. The bill is expected to pass in the Senate and become law by the end of the year (The Guardian, December 13, 2015). According to officials in Europe, European countries are making a list of missing Syrian and Iraqi passports, due to the risk that they will be forged and used by terrorists in order to travel to Europe and other countries. The list contains thousands of serial numbers of genuine passports, which were held at government offices in Syria and Iraq and that have been taken over by terrorist organizations. The list was initially compiled in the summer by a number of European countries and additional passport numbers have since been added to it (Reuters, December 12, 2015). Russian involvement in Syria: according to Al-Julani, the Russian attacks do not change anything in the balance of power in Syria. According to him, the Al-Nusra Front has passed the “shock phase” as a result of these attacks, and the fighting continues.Al-Julani believes that Russia is not competing with Iran on Syrian territory, and that there is a “division of labor” between them. According to him, the Russians want a foothold in the region, while the Iranians are also involved in grassroots activity, engage in spreading Shiism and seek to take over Syria from a political standpoint. Turkish involvement: according to Al-Julani, Turkey aims first and foremost to fight the Kurds, thereby strengthening the Islamic State. According to him, under Sharia law, the Al-Nusra Front is prohibited from cooperating with Turkey and therefore the Al-Nusra Front transferred its strongholds north of Aleppo to various rebel groups. The connection to Al-Qaeda: the Al-Nusra Front is Al-Qaeda’s branch in Syria and will remain so. 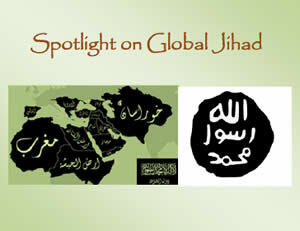 The organization has no intention of severing its ties with Al-Qaeda. However, Al-Julani noted that the organization’s mission is to fight against the Assad regime, Hezbollah and its allies, and not against the United States or the West. Support for the organization: according to Al-Julani, the organization does not receive weapons or any external support whatsoever from any country. According to him, the Al-Nusra Front has tanks, BMP APCs and anti-aircraft weapons, seized from the Syrian Army or purchased from other organizations. He said that there were “several commercial and economic fields” that the Al-Nusra Front was engaged in, in order to finance the purchase of weapons. The southern front (i.e., the southern Syrian Golan Heights): the Al-Nusra Front is busy in this area fighting against the Al-Yarmouk Martyrs Brigade and other organizations in the region that receive assistance from the United States. 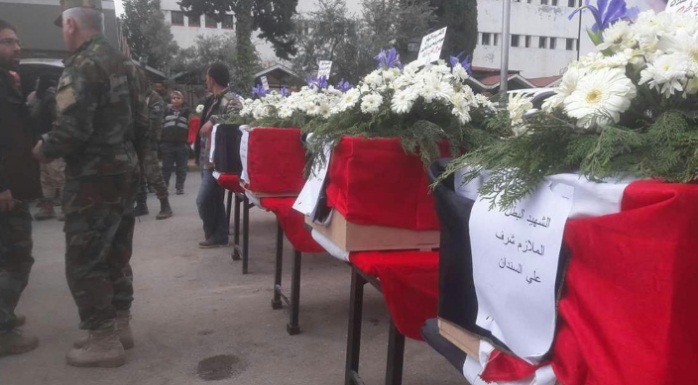 The Syrian government tried to take advantage of the fighting between the organizations in order to attack them from the direction of Quneitra, but failed to do so. ISIS has published a song in Mandarin Chinese called “Muslim Brothers,” in an attempt to tempt Chinese operatives to join the organization.The Chinese Foreign Ministry spokesman said that the international community must unite to fight terrorism (Sputnik, December 9, 2015). ISIS’s call on Muslims in China in Mandarin Chinese is unusual, and it is an indication of ISIS’s interest in recruiting more operatives from China, with an emphasis on Muslim separatists. The Uyghur operatives fighting in the ranks of ISIS in Syria are members of a Muslim minority with separatist tendencies, residing in the Xinjiang Autonomous Region, in northwestern China. According to a report by counter-terrorism experts in China, Uyghur Muslim separatists have been going to Syria since May 2012 to join the fighting alongside global jihadists. The report stated that their travel arrangements were made by opposition groups in China, which finance their activities through drug trafficking, trafficking in weapons, abduction and robbery (chinapost.com, October 30, 2012). According to initial estimates, they numbered several dozen. However, according to other estimates (December 2014) by Chinese sources, they number around 300.